To The Wonder: A Beautiful Meditation On Life, Love, And The Wonder Of Existence? 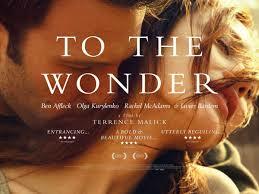 Yesterday, I found myself watching Terence Malik‘s latest film: To The Wonder. Terence Malik is not a conventional director, he is a philosopher in the disguise of a film director. To The Wonder is not a film, it shows up for me as philosophical meditation on life, on love, on God, and on existence itself. It just so happens that this meditation is communicated through film. If you find that that which I speak finds a listening in you then I recommend that you make the time to ‘read’ To The Wonder. And as for any philosophical reading it is necessary to do so when one either creates for finds oneself in the right mood and with the right listening – a listening that allows the speaking to show up as meaningful. What more is there to say on To The Wonder? Allow me to share with you snippets of the sayings (on To The Wonder) that speak to me and shed some light. “On a deeper level, the film is Malick’s meditation on the Christian vision of love — and the obstacles that we perversely place in the way of satisfying our irrepressible longing for it. Anyone who’s fallen in love is familiar with the feeling: The world appears transfigured. In the first words of the film, Marina describes it as being “newborn,” called “out of the shadows…….. Author Maz IqbalPosted on January 11, 2014 Categories Being/Experience, Insights, Relationships, StoriesTags 'God', being, every person needs love, existence, experience of falling in love, grief, hopes and dreams, life, Loss, love, passion, perfection, relationship, suffering, transformation, wonder of existence2 Comments on To The Wonder: A Beautiful Meditation On Life, Love, And The Wonder Of Existence?